The CT Area minimum looks likely to be about now, but due to the massive flooding that's hit Boulder Colorado, eg here, NSIDC is down at present. And Cryosphere Today (Univ of Illinois) seem to rely on NSIDC data. The people at NSIDC have more important issues to deal with than getting data out on time, so the data comes when it comes, my inconvenience is irrelevant. Talking about irrelevant, the Daily Mail's resident village idiot David Rose has been coming out with more ill considered and poorly researched crap. I'm not going to waste my time with jerks like him, but it has moved Jim Hunt to start a website in response called The Great White Con, all I can say is best of luck to anyone who's got the motivation to take on jerks like Rose. Rose has also been coming out with crap about Global Warming having stopped, which allows me to segue neatly out of that particular 'pit of stupid' and onto something more interesting. There's a new paper out by Kosaka and Xie "Recent Global Warming hiatus tied to equatorial Pacific surface cooling." There is an article discussing it over at Science (#), and it has drawn quite a response from the blogosphere. Notable amongst the blog responses is from Tamino, (#, #), because Tamino was co-author of the Foster and Rahmstorf paper(#), which along with a paper by Kaufman(#) showed the recent hiatus in GW was due to a mix of ENSO, solar activity and sulphate aerosols. So in this sense Kosaka and Xie add further confirmation of what was already broadly known, although they strengthen the role of the ENSO, and provide further useful detail. 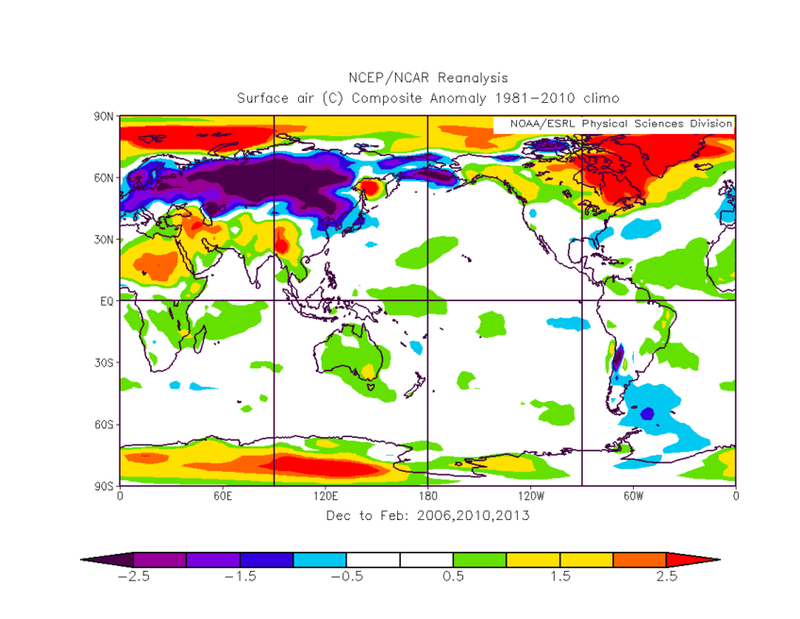 What interested me was the issue with regards northern hemisphere winter cooling. Note that I've not felt motivated enough to pay Science's exorbitant £22 on the paper, what follows is from various articles and blog posts, and now I find I can't upload the image I wanted to as my provider is down right now... So I've uploaded to my Google Drive, here. The left panel shows observed temperature change over the recent 11 year period, the right is the result of Kosaka and Xie's model. My photo provider is now up and running, so here is the graphic from Kosaka and Xie. And for comparison here is an NCEP/NCAR plot of average temperature for DJF for the winters of 2005/6, 2009/10, and 2012/13 (cited by Petoukhov/Semenov, Cohen, Cohen, respectively) which are winters showing the impact of Barents Sea ice cover and snow advance on winter temperatures. 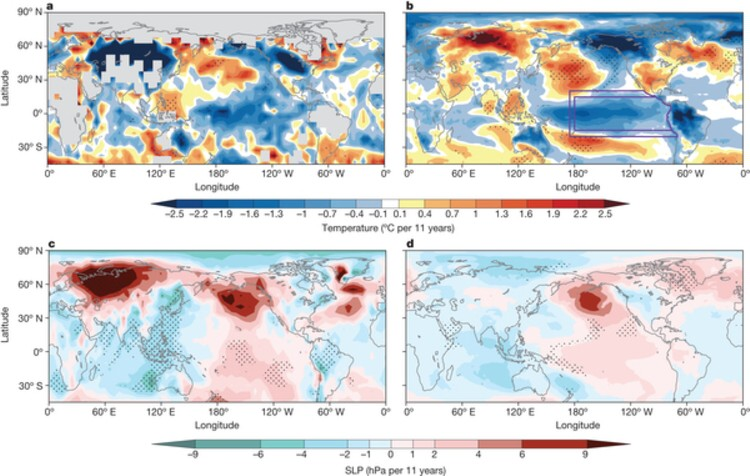 The model fails to simulate the SAT [surface air temperature] and sea-level presure (SLP) changes over Eurasia, suggesting that they are due to internal variability unrelated to tropical forcing (Extended Data Fig. 5a and c). I've previously blogged on Judah Cohen's work, e.g. here. Cohen finds that northern hemisphere cooling is due to changes in snow line advance in autumn probably due to Arctic sea ice changes. The Eurasian cooling that is not accounted for by Kosaka and Xie is precisely the main region of cooling Cohen blames on sea ice loss (via snowline changes). So the two studies fit fairly neatly together. In America however much of the cooling from the eastern seaboard up towards Alaska that Cohen blames on snowline changes is claimed by Kosaka and Xie to be due to ENSO. Likewise both studies claim the western European cooling. The point I take from this is that while further examination might allocate causation to either ENSO or autumn Eurasian snow line advance, it is quite possible that both factors are playing a role. With regards Europe this becomes even more likely when one considers the results of Petoukhov and Semenov(#) with regards Barents sea ice recession and it's affect on European winters. So I still think that what Kosaka and Xie state is "internal variability unrelated to tropical forcing", is actually due to loss of sea ice, and while the ENSO will probably shift, ending the hiatus of GW, the sea ice remains on a trajectory to a seasonally sea ice free state. Which suggests more cold winters, although for how long is debatable, as Petoukhov and Semenov find the regime of higher incidence of cold winters (doubling of the incidence of extreme cold events) from Europe to China occurs when winter Barents Sea ice concentration decreases between 80% and 40%, below 40% a new regime begins to assert: with extreme winter warm anomalies becoming more common over the same region. With sea ice higher than in recent years it might seem that we'll be in for a warmer winter than last winter (which was certainly cold here in the UK). But ice extent and area are around 2009 levels, and what followed 2009 was the 2009/10 record hard winter. Sea ice loss is already well into the realm of winter atmospheric effects, a bit more ice this winter doesn't take us out of that domain, nor does being in that domain mean every winter will be colder than usual. It includes a 30 minute interview with Wieslaw Maslowski in December 2007. All parties can now be sure of precisely what he was saying way back then. Since the Mail were misrepresenting that, along with lots of other things, I am now copying the Press Complaints Commission in on all my correspondence with David Rose and the Mail on Sunday. I seriously doubt if it's a massive enough abuse for the PCC to be interested, but good luck anyway. I wasn't aware of the Great White Con website; I'll have to keep an eye on that. Oh, and I have access to a .pdf of the Kosaka and Xie paper, if'n you'd be interested. Thanks for the offer Anon, someone else has sent me a copy. Thanks for your good wishes Chris. I suspect that the PCC has far fewer teeth than a great white shark, so some luck might well come in handy! Time will tell. I'll let you know how things work out in the end. I actually have some modest success to report Chris. We have contrived to persuade The Mail to retract the most outrageous of the headline numbers concerning Arctic sea ice that they published on September 8th. They have of course endeavoured to blame the NSIDC for their own shortcomings. Next we'll try and persuade The Telegraph to do likewise. Then of course there's all those other inaccuracies that they both still need to make amends for!